I had heard about price discrimination in my economics classes, however, I had never quite realized its relevancy to my life until then. I looked at the Pakistani man holding up the Barcelona t-shirt, smiling and prattling on about its fine design. The only thing I could think about was that there was no way that I was going to spend the equivalent of 30 USD for that crappy little t-shirt. I began to walk out of the store, and as I began to do so, he began to name lower and lower prices. Price discrimination is when a seller charges different prices to different people for the same exact goods. Upon getting outside of the store, I realized his tactic in doing this: All of the items were marked at ridiculously high prices – just in case I was willing to pay that price. Since I wasn’t willing to pay, he was willing to offer me lower prices. Based on my reading, I knew that this was a common practice in other areas of the world, so I decided that I might as well give it a shot. There were 20 Pakistani tourist shops on this street alone – lots of opportunities for experimentation. 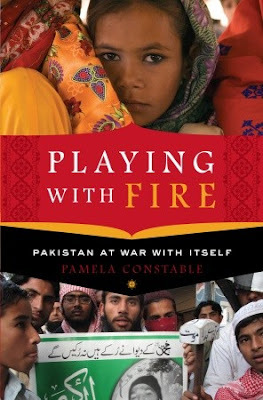 When searching for a book about Pakistan, I had absolutely no idea of where to begin. If the basic system of shopping was so different between the American and Pakistani cultures, I knew that I would be embarking on a journey to learn about a culture completely different from my own. I eventually decided upon the book “Playing with Fire: Pakistan at War with Itself” by Pamela Constable. It was one of the first books I read in this book challenge, and thus, my system for choosing books was not yet perfected. Needless to say, this book might be a little subjective. In order to gain a better understanding, I met with a friend of mine – a young Pakistani graduate from my college who has ambitions to go to medical school – and requested that she read the book and give me her opinions. She has since returned the book and we have plans to get together soon to discuss the book. Justice System in Pakistan: The way that the justice system in Pakistan is described in this book is very negative. According to the author, trials last so long that it essentially puts the lives of anyone involved “on hold” for years. Trials can be easily swayed by bribes to corrupt judges. In the countryside, often justice is administered by a local leader – often leading to devastating results for women. For this reason, the author states that many are advocating the implementation of sharia law, or law based on solely Islam. (The sharia law is what the Taliban implemented during their rule in Afghanistan.) To those from Pakistan, how would you describe the administration of justice? Does the author describe it well? Do you support the implementation of sharia law? Why or why not? Conflict with India: For a long time, Britain controlled most of South Asia through the one Indian administration. Due to the politics during and immediately following World War II, the area divided into two main parts, Pakistan and India. I know that there is a great deal of competition and disdain between the two countries – which were the underlining motivations for Pakistan to develop the "Islamic bomb," or become a nuclear power. I know a great deal about the current events of this relationship, but not its history: When and how did this conflict begin? Image of the United States: I was interested to read about Pakistani opinions of the United States. I didn’t expect them to be very high, based on my observations of a frequent viewer of Al Jezeera. In 2010, the Pew Research Center discovered that it was extreme with “only 17 percent of respondents saying they had a ‘favorable’ view of the country” (page 239.) I can understand this – as I myself feel uncomfortable with the drones (and they aren’t even being fired into my country.) However, I was interested to read how much aid is given to Pakistan – billions of dollars. How is it that the United States can give such exorbitant amounts of money, while at the same time, be received with disdain by the local people? Perhaps a part of the answer is the social rigidity of Pakistan and the importance of the army – making the money inaccessible to the common people. Perhaps another part of the answer is that the United States has an agenda when it gives aid. I would love to hear Pakistani people’s opinions on how the United States can better its public image in this country. The US pays others to do some fighting.